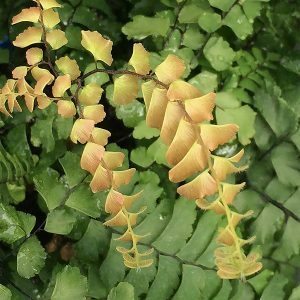 A very attractive small fern, Adiantum fulvum is commonly called the ‘New Zealand Maidenhair Fern’. With soft mid to deep green foliage it grows naturally as an understory plant in moist conditions. The leaves grow very close to the stem giving a mass os dense foliage. New foliage is an attractive pale orange to yellow, turing to green as it matures. This is a fern that grows very well in cooler positions, it is an excellent choice for damp positions next to buildings. This a very different species to the Common Maidenhair Fern. Widely grown as an indoor plant, Adiantum fulvum works well in containers as well as in hanging baskets. It is also suited to growing outdoors on the margins of shaded water features and ponds. With a natural upright growth habit, this attractive little fern will reach around 30 cm in height. A moist soil rich in organic matter is essential, preferably slightly acidic with a position in dappled to light shade. Dig in some well rotted compost and a cow manure before planting if needed. Do not allow the soil or potting mix to dry completely, regular watering will be required especially in summer. Applications of liquid seaweed fertiliser from spring through to autumn will help promote strong growth. Over time this is a fern that will slowly spread by underground rhizomes to form a good colony. Easily divided if required. 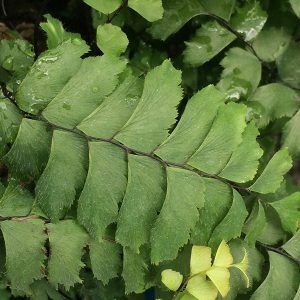 Adiantum fulvum is available for sale from the following nurseries.